The FileMaker Server Admin Console / Admin Server is responsible for the management and monitoring of the configuration and process of the FileMaker Server database management system (DBS). To administer FileMaker Server, you can use Admin Console on the computer where FileMaker Server is running or on any computer that has network access to the master machine running FileMaker Server. To secure remote administration, Admin Console uses Secure Sockets Layer (SSL) technology to encrypt HTTPS connections from other computers. 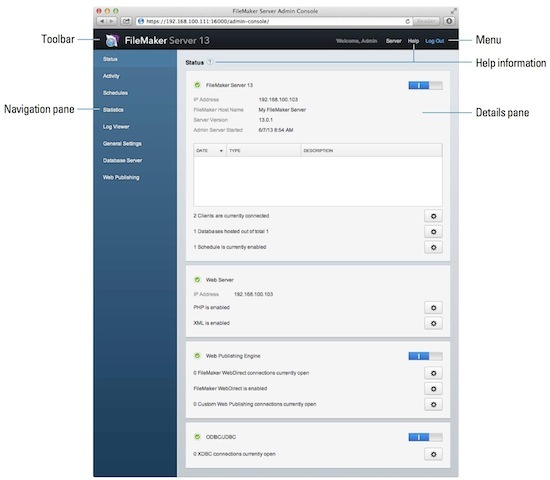 You administer FileMaker Server by choosing options on the menu and Navigation pane. The results are shown in the Details pane, where you can select tasks, specify configuration settings, or monitor activity. Delegate database administration tasks to group administrators. Use a group start page to list the databases used by an administrator group. The FileMaker Server Admin Console is no longer used to upload files to FileMaker Server. To upload a file to FileMaker Server, use FileMaker Pro OR manually upload database files to the server. You can start Admin Console on a Windows or Mac OS computer that has network access to the master machine running FileMaker Server. For more information about FileMaker Server and using the Admin Console, see the FileMaker Server Getting Started Guide.